A retail site in Edgewater that lost its grocery store anchor more than 15 years ago is poised for resuscitation, this time with a food hall at its heart. 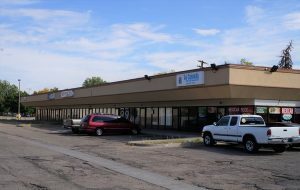 Denver-based LCP Development is slated to redevelop the 6.7-acre site at the northeast corner of 20th Avenue and Depew St. in the city just west of Sloan’s Lake. The company purchased the property last month for $5.8 million, according to records. There are three buildings on the property: a 52,734-square-foot former grocery store set back from the street, an 11,412-square-foot retail strip perpendicular to 20th Avenue and a freestanding building at the corner of 20th and Depew. The property has been mostly vacant for years, with just two tenants. A liquor store operates in the freestanding building, while a Mexican restaurant operates at the southern end of the retail strip. 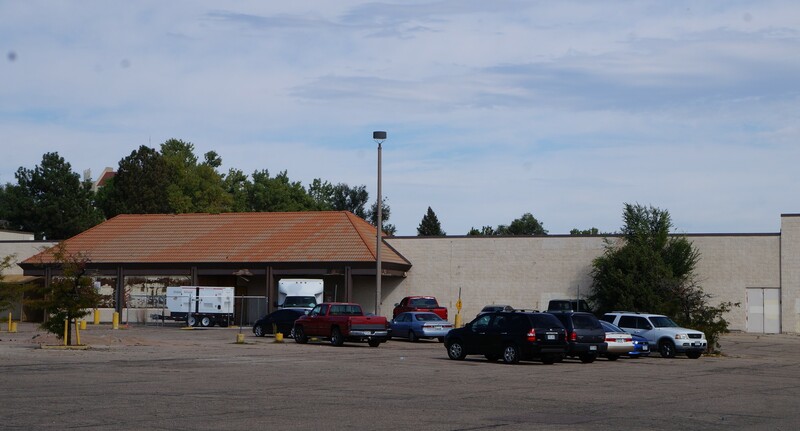 The main structure was once a King Soopers, but the store relocated two blocks away in 2001. LCP purchased the property from the City of Edgewater, which bought it for approximately $1.5 million in 2004, according to records. Through the years, several plans to repurpose the site were floated, but none came to fruition, and the property remained in the city’s hands. LCP Principal Tim Schlichting said this week that his company plans to renovate the existing structures and build one new one. The company is rebranding the site as Edgewater Public Market, and expects to include a mix of retailers along with about 20 food and beverage purveyors. Schlichting said, “More than half the center is either under letter of intent or in active negotiations,” although few leases have been signed. He declined to name specific tenants, but discussed the types of businesses expected to move in. The former grocery store: Many of the eateries will be in the food hall, which will comprise approximately one-third of the former grocery store. It will feature a central bar and common seating areas. The remainder of the building will house full-service restaurants with their own seating areas, as well as small retailers, Schlichting said. Additionally, a brewery has signed on to take the west end of the building and will operate a taproom. Schlichting said the company will get a common consumption license for the building, allowing patrons to carry drinks between establishments. 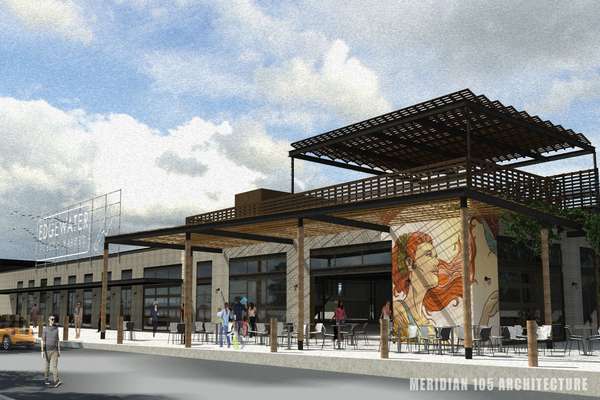 A rooftop deck with additional seating will be installed on part of the building. “We’ve been up on that roof, and there’s terrific views of the skyline,” with Sloan’s Lake in the foreground, Schlichting said. The liquor store: It occupies the 3,484-square-foot freestanding building on the southwest corner of the site. Schlichting said a “donut concept” will take over that space. He said LCP hopes to relocate the liquor store elsewhere in the project, but that has not been finalized. 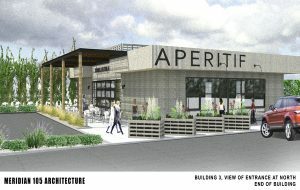 The retail strip: The renovation of the 11,412-square-foot retail strip perpendicular to 20th Avenue will add about 1,000 feet to its footprint. Mexican restaurant La Cascada has been the only tenant in the building, taking just a portion of it. Schlichting said the restaurant is expected to stay onsite, but will move into the building, which is being renovated to allow for four to five tenants. A natural foods-type restaurant, serving items such as smoothies and salads, is expected to move in, and Schlichting said the company was in talks with a yoga studio and CrossFit gym, as well as a natural pet food retailer. The rest of the site: A plaza, featuring a lawn and seating, will be set up between the existing retail strip and the new structure. “We’re building a movie screen to be able to do outdoor movies,” Schlichting said. 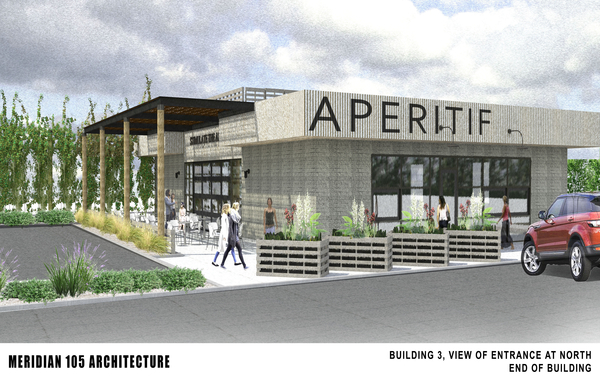 Additionally, a pedestrian promenade will be installed coming into the site from 20th Avenue, making the site — which currently is situated around a massive parking lot — more walker-friendly. More than 400 parking spots will remain. “One of the advantages is we actually have parking,” Schlichting said. Additionally, most of the eateries will have outdoor patio seating, he said. The timeline: LCP has begun work at the site, and Schlichting said the company hopes to wrap up by July or August 2019. It’s possible some tenants might move in and open earlier than that, he said. Meridian 105 Architecture designed the project. 8020 Builders is the general contractor. OZ Architecture is assisting with branding and marketing. Brokers Ken Himel and Shawn Peel with David Hicks & Lampert are marketing the units. The past: Several plans for the site have been floated. In 2003, prior to Edgewater purchasing the site, the city envisioned turning the property into Edgewater Civic Center, a home base for municipal offices, according to Colorado Community Media. By 2007, Edgewater was talking publicly about luring an indoor ice rink to the site, with one City Council member telling The Denver Post, “We need something to make us a destination. The biggest draw we have is the Edgewater Inn for pizza.” In 2011, however, the Post reported that a development partner involved in the project, which would also have incorporated municipal offices, lost financing months short of the groundbreaking. In 2015, BusinessDen reported that Georgia-based Trinity Development Group had the site under contract and planned a mixed-use development, with a handful of townhomes, more than 100 apartments, and retail and restaurant space anchored by an upscale grocery store. Edgewater City Manager HJ Stalf said Tuesday that the development hinged on the grocery store. Natural foods retailers expressed interest in the site, he said, but none committed. “Different ones didn’t do it for different reasons,” he said. Stalf, who has worked for Edgewater for nine years, said the site has been “a significant hole in our commercial portfolio,” and the city really wanted a use that would attract shoppers. “We, like most cities, are primarily funded by sales tax,” he said. Schlichting said once LCP found the site, its plan always was to renovate the existing structures. “The main question was, what do you do with the big building?” he said. Schlichting said the company never pursued a single user for the building, and settled on a food hall in part because there isn’t one nearby. “We just really felt like the west side was not as well-served,” he said. 3 Comments on "Food hall to anchor redevelopment of mostly vacant retail site in Edgewater"
Do residents get input on what’s there? It would be silly to give us a vote but some ideas may not be obvious. How about the only spot in the metro area to have dessert and coffee at night? Or street food that’s not the same old beer bro cliches? Basically something that’s out of keeping with the prevailing local monoculture that comes with a lot of the redevelopment. Why don’t you put your idea into action and open it up at the food hall? People vote with their dollars. If your idea is good, you will thrive. If nobody votes, you pack up and leave. You had 15 years to buy that lot and birth your idea, but you did nothing. Now someone else has an idea and you feel you should have some input. Things don’t work your way. I’m Excited to find out which “Natural Grocery” will be signing on. I’ve heard all sorts of rumors. Trader Joe’s? Sprouts? Natural Grocer?